Do you believe the age old saying survival of the fittest ? This ideology no more exists and with time it has evolved. So this is now to be believed as survival of the fittest and most innovating. In today’s world you just cannot be fit in business however you have to be the Game changer and the innovator. Innovator term just doesn’t mean that you are able to pour in more money in the business and product marketing and sales or brand building. To sell today it takes more effort and pain to understand, know and tailor your customer’s need. Customer in today’s world is no more similar than one he use to be in 90’s. The customer today is more informed and before he comes to make in the purchase decision he or she is well aware of 10 different products in the market. Thanks to the eCommerce industry which is able to bring virtually all the products on our mobiles handsets. Customer today is much much passionate about buying since he is very elemental in his choice and with each decision he has his emotions attached to it. Especially with the house and home where he / she is investing the whole family savings there takes a good wise thoughts for him which makes him take this decision. One of the real estate companies driven by the millennial folks were very keen and passionate about what they were going to built for their home users. They had this fine , state of art property coming up in the sub urban part of Surat Gujarat, India, which they wanted sell to the people. They had all the basic amenities for ultra modern living with all necessary automation and green living required in their property. Nevertheless they were very focused on delivering a best customer experience to their customer. However best they created the paper based collaterals and marketing tools, they knew that they would have a tough time for sales in current property market and economic scenario. In the same vicinity, where they were coming up with the 40 apartments – their neighbourhood was full of newly constructed 240 units of township and modern living apartments. They knew – selling wont be easy because customer would be learning all around them and therefore it would take lot of time for them to understand their needs and pitch the right set of 2, 3, 4 BHK apartment. This ability to see and foresee the challenge was the key point where they started discussion with IT consultants like us to leverage the business on technology to create the wonderful experience for the prospective customer. The consultants of iView Labs understood their needs sketched the entire customer experience imagination for them, before they came up with the vision to have the interactive sales and site offices. We suggested them to go virtual and online with CRM enabled systems to know their demand and remember their likings of their prospective customer. Since while buying a house the individual always makes a multiple visits to check the new apartment and also he / she comes with their close family members for their opinion. Not only this – for any kind of customisation in the newly built property of the visitors, it is very important for the Property developer to know and remember the need of their prospect. In such cases they were in real need of a Platform which could help the sales managers at the site offices to give the presentation and record each and every minutes of meeting held with customers. The very basic need became their prime agenda of sales and corp communications for their clients and prospects. 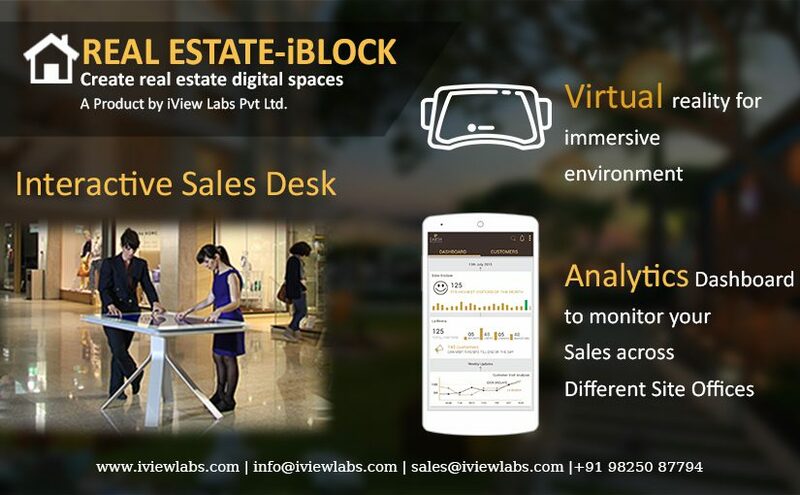 We at iView Labs suggested them to make a Presentation Suite which comprises of their all Pictures, Images, Video, 3D files, Panorama, Plans, elevation and locations coordinates, EMI calculators and PDF files for property specs etc. All the necessary assets required for configuration were programmed and bundled in one software application iBlock Sales presenter for Real Estate Industry (Real Estate) which was then enabled with the tailor made CRM (Customer relationship management) software in the backend. Now when the tools and platforms were powered by most innovative tech the next thing was to present it to the customers and visitors who were then mesmerised with the content and the entire presentation of the property. Therefore post each visit the customer gets a text message and the mail of all the collaterals for which they had their interests. This idea of personalised promotion helped the customers and visitors get the only interest information related to their need. Also this helped them to get the day to day updates from the CRM campaigns and text messages. The visitors to a large extent were saved from the spam messaged moreover the relevancy of the information was the key which kept them engaged to the platform. To much of the surprise the right choice of asset corresponding to the customer’s interest area and timely updates and communications with right servicing helped the users gained the confidence in the real estate player and this helped them in their decision making. Its been 3 years and close to 500+ apartments have been presented on this platform and close to INR 400 Cr (US$ 80m ) have been sold using this platform. Recently we have centralised the backend of CRM to an extent where any inquiry coming in from the Website, Multitouch desk (interactive surface) and walking can be captured in the CRM and therefore this helps them a religious customer interaction and engagement. Since the system database grew big and huge and therefore management and board of directors where looking forward for some kind of analytics. The questions of how well the sales offices and sites offices are functioning and how many customers they were able to capture was an information much essential for them to know without knowing the MIS (Management Info Systems) reports. So we planned the Mobile app for the stake holders wherein they can get the information on live sales nos. and leads happening at site offices. This helped them to make the strong ties and relations with Brokers and Customers by practising the transparency. We at iView Labs are people who are driven by the passion to solve challenged at the fundamental level. We don’t see technology, however we see solutions which can empower the people to realise their productivity, quick sales, preventing loss of information by making our customer adopt smarter ways to do business.